Federal High Court, Justice Stephen Pam in Abuja yesterday insisted that the Inspector-General of Police, Mr. Ibrahim Idris, must arrest and produce the Chairman, Independent National Electoral Commission (INEC), Prof. Mahmood Yakubu in court on Thursday. A panel of three Justices of the Court of Appeal led by Justice Abdul Aboki had on Monday suspended the order of arrest of Yakubu earlier made by the lower court. However, at the resumed hearing of the matter yesterday, the court insisted on its earlier order following the absence of Yakubu’s team of lawyers in court and there was no explanation as to why they were absent. According to the judge, “at the commencement of proceedings, counsel for the applicant, Kanayo Okafor, informed the court that the Court of Appeal on Monday asked the court to stay proceedings in the matter. 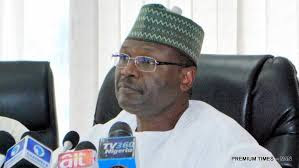 “The contempt proceedings and the bench warrant issued for the arrest of Prof. Mahmood Yakubu, INEC chairman, subsist. The IG is to carry out the order of the arrest of Yakubu. The court refused to recognise him and consequently adjourned the matter until August 16 for continuation. It was, however, gathered that the counsel was late because he was at the Court of Appeal making efforts to get the Monday ruling to present to the lower court, but the ruling was not yet ready. New Telegraph recalls that the Federal High Court had, on August 1, issued a bench warrant for the arrest of Yakubu for “flagrant” disobedience of court orders. Justice Pam had on July 5 dismissed a preliminary objection and a motion challenging jurisdiction to hear the contempt proceeding filed by Yakubu. However, Justice Pam said he would not deliver judgement on the contempt proceeding in the absence of the alleged contemnor. Following the service of Form 49 on the INEC chairman, the court summoned him to show cause why he should not be committed to prison for disobeying the order of the court made on December 5, 2014, restraining him from accepting or receiving or according recognition to any list of nominated candidates for elective posts for the Senate, House of Representatives and House of Assembly of Anambra State in the 2015 general elections, except those that emanated from the plaintiffs, which order was affirmed by the Supreme Court on January 29, 2016. Not satisfied with the position, Yakubu, through his counsel, Adegboyega Awomolo (SAN), approached the Court of Appeal challenging the arrest order. The President of the Court of Appeal, Justice Zainab Bulkachuwa, however, constituted a three-man panel to hear the appeal. Though the court is on vacation, members of the panel were recalled to hear the appeal. When the court sat on Monday, the case was mentioned, but hearing could not continue. It was subsequently adjourned till September 17.